Room 510 of the Federal Court in Old San Juan was crowded with almost 100 citizens on Monday, May 14, at 9 a.m. They were fulfilling their jury duty obligation. Yet this is not any trial. It is a case of damages over retaliation in the workplace, the facts of which include FBI investigations, Russian spies and an alleged hostile work environment by the Acting U.S. Attorney in Puerto Rico, Rosa Emilia Rodríguez-Vélez. The plaintiff, Francisco Reyes-Caparrós, says that while serving as an intelligence specialist in the Office of the Federal Prosecutor in Puerto Rico, he was a victim of retaliation from 2012 to 2015 by his superiors, including Rodríguez-Vélez, who is the federal official of highest rank in Puerto Rico. Reyes-Caparrós, 38, who is now a lawyer, alleges that the pattern of actions against him forced his resignation in 2015 after almost six years of working with the federal government. That same year, in September, he sued the Federal Prosecutor’s Office. It has taken three years for the case to go to trial. Shortly after noon, four women and four men were chosen as the jurors who would see the trial that began that same Monday afternoon. The judicial process is expected to last at least two weeks, as anticipated by Joseph Laplante, the judge in charge of the case, who comes from the district of New Hampshire. From a coffee shop across the street from the federal building in Old San Juan, the interim chief prosecutor in Puerto Rico waited alone for her lawyers. During lunch, before the trial began and after almost two hours of waiting, Rodríguez-Vélez spoke briefly with her team of lawyers. She finished her meal and went to the fifth floor of the federal court. There, standing in the corridor, she waited for the trial to start. Unlike in the morning, there was no longer any murmuring in Room 510, and only the judge, the lawyers of the parties, some court officials and a citizen who also happens to be a journalist, were present. Shortly before the entrance of the jury and the start of initial arguments, the lawyer defending the U.S. Attorney Office, Jason Weida, asked to address LaPlante. “Your Honor, we anticipate this will be a high profile case,” Weida said. LaPlante immediately asked, “You’re not asking for a gag order?” The lawyer explained that he was not asking for a gag order, but that the parties and lawyers refrained from making statements to the press during the course of the trial. After clarifying that he would not be issuing a gag order, the judge said although he does not prohibit comments to the press, he strongly discourage them. The jury made its entrance at 2:45 p.m. and received the judge’s initial instructions. 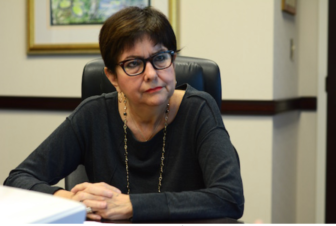 LaPlante emphasized that the objective is to determine if Reyes-Caparrós carried out actions protected by law and because of this he was subject to retaliation at work by his superiors. The plaintiff’s attorney, Bamily López, argued in her initial turn that Reyes-Caparrós’ life “completely changed” at the end of 2012, after providing a bulletproof vest to Idalia Mestey-Borges, a former federal agent who was allegedly a target of threats at that time. The plaintiff alleges that his supervisors did not see this decision with good eyes, because Mestey-Borges — who testified on the first day of the trial — had a complaint against the prosecutors’ office before the Equal Employment Opportunity Commission. After this incident, Reyes-Caparrós suffered a pattern of reprisals that included stripping him of his management position, transfers of offices, investigations, scolding, surveillance, tasks destined to fail and his eventual resignation because of these working conditions, according to López. Two other witnesses in the case, Carmen Márquez and Nelson Pérez, also have similar complaints against the Federal Prosecutor’s Office for hostile work environment. “In this case, Rosa Emilia is not the head of the federal prosecutors; Rosa Emilia is the person in charge of this office,” said the plaintiff’s attorney, emphasizing that it is a claim of labor discrimination. On the other hand, the attorneys for the Federal Prosecutors began their initial statement presenting Rosa Emilia Rodríguez-Vélez to the jury, shortly after she made her entrance to the courtroom and was the only other person sitting in the audience. 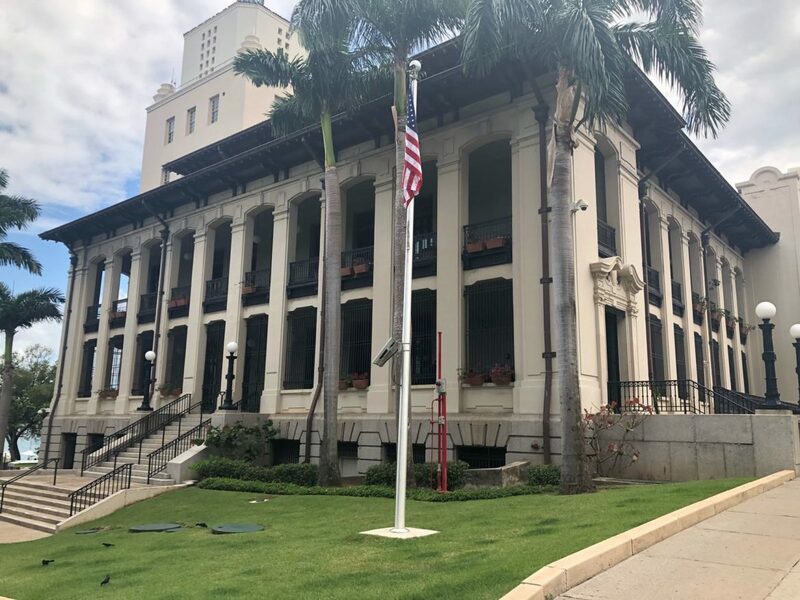 Reyes-Caparrós’ defense did not object, neither did the Judge, so the jury met the Head of the Federal Prosecutors in Puerto Rico, while Rodríguez-Vélez stood looking at them from the audience. Once her attorney finished his initial statements, the federal official left the courtroom. She is, nevertheless, on the list of witnesses, so she is expected to testify at one point in the trial against her and her office. Weida and the defense team affirm that the disciplinary actions taken by Reyes-Caparrós’ superiors happened in response to an ongoing investigation that the FBI was conducting regarding the plaintiff. The reason? Reyes-Caparrós interest to travel to Russia as part of a cultural exchange program. “This case is about bad judgment [on the part of the plaintiff] and a Russian spy,” Weida argued, adding that Reyes-Caparrós could not exercise the intelligence functions he had until October 2013 due to the investigation carried out against him by the FBI. That was when Reyes-Caparrós received an invitation to travel to Russia to participate in a cultural exchange program coordinated by Yury Zaytsev, an alleged Russian spy. Because of this, the FBI began an investigation into Reyes-Caparrós in October 2013, after which the pattern of retaliation claimed by the former employee began. According to the defense, this investigation was the reason for the decisions made by Reyes Caparrós’ superiors, which the plaintiff identifies as reprisals. Neither the FBI investigation — which culminated at the end of 2015, after Reyes-Caparrós’ resignation — nor another investigation carried out by the Office of the Inspector General, recommended disciplinary actions against the plaintiff, nor did they find criminal conduct, the plaintiff’s lawyer said. In addition to the head of the federal prosecutor’s office in Puerto Rico, expected to testify at the trial are: the former director of the FBI in Puerto Rico, Carlos Cases; María Domínguez, who worked under Rodríguez and currently works at the McConnell Valdés law firm; and well-known federal prosecutors on the island, Timothy Henwood and José Capó. Reyes-Caparrós’ defense has 11 people on the list of confirmed witnesses, while Rosa Emilia Rodríguez-Vélez’s lawyers have 16. Already on the third day of the trial, only four witnesses had testified and Judge LaPlante warned the lawyers that the process was taking too long. At the same time, there was also a story by El Vocero that named Rodríguez-Vélez as one of two candidates to formally occupy the position, and another story from the Wall Street Journal about the U.S. Department of Justice’s alleged intention to replace Rodríguez-Vélez after almost 12 years in office on an interim basis. The head of the Federal Prosecutor’s Office in Puerto Rico was appointed to the post in 2007 by the judges of the U.S. District Court, but more than 10 years after her appointment and an extension of her term, Vélez-Rodríguez has never been confirmed by the U.S. Senate.